It’s strange to think that only a few years ago most school meals were pitifully unbalanced, unhealthy and unappetising. As a new local authority Healthy Schools adviser I did my best to persuade the contract managers and the providers to up their game but to no avail. I was told constantly that schools were happy with meals. They weren’t. They were very unhappy with meals but because there was no comprehensive complaint system their complaints went unaddressed and the meals remained poor. Parents and children voted with their taste buds and chose packed lunches. Children on free school meals weren’t so lucky. 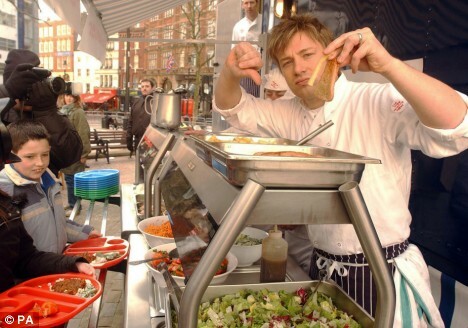 Then Jamie Oliver came along and added his voice to the debate. Because it was Jamie, people started listening and agreeing that the food in our schools was not good enough. In the borough where I worked this call was taken up by parents who demanded that the local authority ensure their children had better food. To cut a long story short, a huge battle ensued with demonstrations, confrontations and demands but the parents were right. Their children should have nutritional, tasty food in school that sets them up for learning. Standards in school food should apply for breakfast, lunch and snacks. Coupled with the then government’s commitment to extended services, children in wraparound care would be fed well and healthily. Because of parent power, we were one of the initial authorities to improve the menus and reinstate well-equipped school kitchens at huge cost. Unfortunately many schools don’t have adequate cooking kitchens because following the privatisation of school meals contracts in the 1980s they only needed warming cupboards or serving hatches. The government eventually listened to Jamie and the parents. They set up the School Food Trust to regulate food and offer support and training to staff. I remember going to one of the huge dinner lady training sessions at Lord’s cricket ground. It was amazing seeing all those women committed to cooking better food all in one huge session watching celebrity chefs demonstrate cooking techniques and chattering excitedly about recipes on the tube home. These are the ladies that went from opening a pack of frozen fishy feet (yup, really) and bunging them in the oven to preparing freshly cooked meals brimming with fresh fruits and vegetables. When the School Food Trust brought in nutrient standards, every recipe had to be nutritionally analysed to ensure the correct number of vitamins and mineral went into every balanced meal. It’s not been an easy path to healthy eating in schools. Schools meal take up went down initially and schools have had to work really hard to persuade students to give the food a go. Schools put on taster sessions, healthy eating, workshops, award prizes and hold theme days. Unfortunately newspapers pounce gleefully onto the school meals aren’t working bandwagon and regular bring up the story of the Rotherham mums pushing burgers through the school fence. Shame they don’t ever mention the hundreds of parents who happily pay for good school meals that their children enjoy. As part of my job I used to visit schools to see how well they were doing in terms of health and wellbeing. On these visits I observed mealtimes and checked menus. Luckily I had a nutritionist colleague who checked menus for compliance and supported school meal staff with their promotion of healthy food and understanding of cooking. He was made redundant earlier this year at the same time as me. I’m really disappointed to hear today that some academies are asking the government if they can reintroduce junk food items. The government are keen for many more schools to become academies and it would be a massive step backwards to admit that healthy food isn’t really necessary for students at these academies. The School Food Trust has released a statement urging anyone to tell them if they know of any academies returning to crisps and fizzy drinks. You may think that we tree-hugging do-gooders need to step back and let the academies get on with it. After all, a can of Red Bull and a bag of Monster Munch are hardly going to harm a kid’s education are they? It’s a discussion I’ve had with countless teachers, head teachers and other professionals. We don’t know what the kids are eating- or not eating- at home. When a child is in school we are in loco parentis and it’s is our duty to ensure that they are safe, protected and supported in their learning. If we allow them to be stuffed full of e numbers, sugar and salt then we are failing in that duty, just as much as if we allow poor teaching to go on in schools. It’s been a long hard slog to get to where we are in term soft school health. The government have withdrawn funding for Healthy Schools, school sports and extended services. I’m not prepared to let Gove, Cameron et al erode children’s health even further. for further reading about the road to better school food, have a look at the Merton Parents for better Food in Schools website. Remember when smoking was allowed everywhere? If you’re old enough you’ll remember seeing the cinema screen through a haze of smoke, getting stuck in the smoking carriage of a train. Remember coming home from the pub smelling like an ashtray? It seems strange now we’ve got used to publics places being smoke free and it’s a bit like that now with healthy school meals. Remember when school dinners consisted of turkey twizzlers and sugary puddings? I remember trying to enthuse my Year One class about school dinner by pointing out the delicious mashed potato. It seems almost unbelievable now that schools are expected to provide healthy food options including salad, vegetables, fruit based desserts and plenty of fresh water . 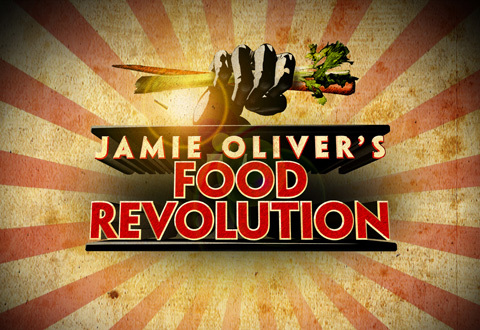 We still have a long way to go in terms of promoting healthier eating options to children but even in our darkest days when the cauliflower was put on to boil at 10am we never stooped to the depths of food hell shown in Jamie’s Food Revolution in Los Angeles. Lord Jamie of Burger has featured regularly in this blog. When writing about his Dream School I mentioned that he’s not shy of a challenge. We know that from his tackling of England’s school meals and of course the infamous Norah but he faced his greatest challenge to date when he tried to improve meals in LA schools. The district superintendent was determined to shut him down from day one and banned him from visiting any LA schools. It might have been the shortest series in history at this point but Saint Jamie of Corndog (Look it up. Ugh) managed to find a school that would let him work with its Culinary Arts students to cook for small groups in school. Door after door was shut in his bewildered, pink face until his filming permits were revoked and you got the impression that if the superintendent could have escorted him to LAX and put him on a plane to the Antarctic on a one way ticket, he would have done. After a few requisite tears, Brigadier Jamie of Curly Fry pulled up his baggy trucker jeans and set up a kitchen opposite the school so parents and students could at least learn about healthy eating after school. In between the school story was the drive thru owner who was eventually persuaded to serve healthier options and the singe dad who was stuck in a fast food rut but it was really only filler to main school event. To cut a long story short with the school story, the superintendent stepped down from his post and his replacement immediately agreed to promote healthy foods in his schools. His first act was to ban sugary, flavoured milk from school canteens. Eat like me, don't dress like me. What it all boiled down to was one bloke taking offence at another bloke who pointed out that things could be improved and refusing to play ball. It makes me wonder how many improvements in children’s lives are curtailed because some blokes decide that saving face is more important than giving in. Now free to involve the schools, Captain Jamie of Lard also recruited some local chefs to mentor schools in improving meal and teaching cooking. One chef, shamefacedly, wondered why it had taken an outsider to get them involved with their schools. But sometimes it takes a subjective view to make you realise what’s going wrong. I hope that in a few years’ time the junk food and flavoured milk on the menu of LA schools will be just a bad memory. My favourite thing about Jamie’s dream school is the same thing that drives teachers and parents: the kids speak their minds. It doesn’t matter if they’re speaking their mind to Jamie Oliver, Alastair Campbell or the prime minister, they don’t stand on ceremony and if they think it they say it. In the final episode, the students received their final report and loose cannon David Starkey was sensibly teamed with everyone’s favourite youth worker, Jazzie B. Within seconds, Starkey continued his run of inappropriate comments while repeating Simon Callow’s equally charmless remarks to a student. Now Conor might be a giant gob in a tie but he’s still just a kid and he shrank visibly as Starkey gleefully told him he’d make a great stand up comedian… if he ever turned up on time. Nice. Uncle Jazzie quickly stepped in and told the poor teen that he could do whatever he wanted if he set his mind to it. The grin on Conor’s face said it all as he said, “do you really think so?” The musician then tried to engage Starkey in some intelligent adult dialogue but was bulldozed by the historian who clearly loves the sound of his own voice to the exclusion of all others. Jazzie B: A+ as usual. A model student. Alastair Campbell was also in trouble. He told a student that she couldn’t come on the visit to Downing Street because she had had an almighty outburst in his class. Campbell likes dishing out the arguments but doesn’t like it when someone argues back. I think he was actually most upset by being called a f****** P**** but it’s nothing most of the country hasn’t thought at one time or another. Once outside Harlem, the most cantankerous of all students and the subject of a stand up row with the headteacher a couple of weeks ago, summed up the visit. Although to be fair it’s probably the same with most senior politicians regardless of political allegiance. At the end of the programme Lord Jamie of Custard admitted, “ Cor lummy cripes swipe me Mary Poppins, it’s bleedin’ hard being a teacher innit, geezer.” I may have embroidered that a little but the meaning is the same. I think what he realised was that many teachers are inspirational and energetic but it’s not always easy to teach large mixed classes successfully. At the end of Dream School we learn that many of the students had given to internships, back to studying or to a course or apprenticeship. Brilliant, I wish them the best of luck in everything they do. If only these amazing opportunities, small group teaching and one to one support was available to all students. Perhaps that’s what Conor meant when he said that the school system was outdated. Dream School is turning into a bit of a nightmare for St Jamie of Twizzler as his ‘teachers’ and students clash and even the head loses his cool. In last week’s post I pummelled David Starkey for his snobby attitude to the students and his lack of teaching ability and it seems that not much has changed. Following the slanging match between the head and a student in assembly, Starkey thought it would be amusing to take the mick out of the student in front of everyone. Nice. Even the head looked like he wanted to throttle the historian. But more about that assembly showdown: I’d like to say I was shocked and horrified by the behaviour of the student but I can’t because I’ve seen it all before. I’ve also seen how a simple misunderstanding can escalate into the sort of stand off that would have Gaddafi backing down. I was surprised at how the head managed- or rather didn’t manage- the situation. The great behaviour guru Bill Rogers teaches about primary and secondary behaviours (which incidentally have nothing to do with the schooling system but are descriptors in their original sense.) It’s very easy to get carried away with the secondary behaviour but you need to focus on the primary. Student (Interrupting): Sir, I want to say something. Teacher: Don’t interrupt me when I’m talking. Student: You don’t need to snap, sir, I was only asking. Teacher: I didn’t snap, you’re being rude. Student: Oh my days! I don’t know why I even bother coming to school, you’re an idiot, sir. And so it escalates. The interrupting was the primary behaviour and the teacher should deal with that. The answering back was the secondary behaviour and the teacher engaged with that secondary behaviour thereby ignoring the original problem and escalating the situation. Make sense? Elsewhere in this episode, students stayed in a Biodome but only one managed to fend off her nicotine cravings and remain inside for two days. Her reward was a trip to Arizona to work with some top Scientists. Hell, I’d leave Mr. R and move into a Biodome if those prizes were on offer! Money guru Alvin Hall, who is all sorts of bow-tied camp deliciousness wrapped around a steely core, had a tricky start when two students decided to try and throttle each other. Soon, however, the entire class was bent over calculators doing real Maths and there wasn’t a peep. One student even stayed on after class to talk about how many ‘woman’ goats he would have to buy to become a squillionaire. Top tip: If you’re going to be a goat farmer you may wish to know that ‘woman’ goats are usually called ‘nanny’ goats. Just saying. I can’t wait for next week’s episode when Alastair Campbell makes his return after instigating a fight in his politics lesson, the students are introduced to the joys of Latin and its routing of Carthaginians and poetry and the ‘teachers’ hoist Sir Jamie of Chip’s under-crackers up the flagpole. 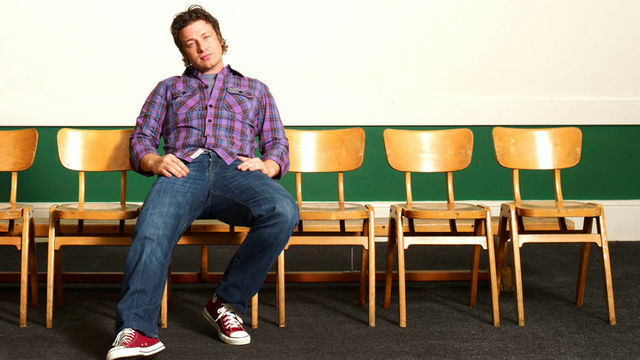 You have to hand it to old Jamie Oliver: he’s not shy about a challenge. I couldn’t bring myself to watch the first episode of Dream School but gave in and tuned in for the second helping. So what does Saint Jamie of School Dinner know about running a school? Well, nothing but he’s well known for having an incredibly successful career following an incredibly unsuccessful school career so he can empathise with the students who have also failed at, or been failed by, school. When it came to his cooking lesson he made a good fist of it (B+). Others were not so lucky. David Starkey, privileged, highly intelligent and passionate about his topic wasn’t a huge success. In fact his behaviour was such that, were he a newly qualified teacher in an ordinary school, he’s have been in serious trouble. Calling a kid ‘fat’ and then whining that he didn’t start it is not very professional or indeed mature. Jamie, bless his little turkey twizzlers, handled Starkey incredibly well and although the historian insisted that the students were ‘feral’, Oliver didn’t give up and got him back in the classroom. Mark: F. See me. Teaching isn’t as easy as it might seem. A lot of comment on the programme has focussed on the poor behaviour and attitudes of the students so I’d like to say a word in their defence. The voiceover told us that several of these kids had been rejected by their chaotic families and were living in council flats alone. Now imagine being rejected by those you love, being alone and vulnerable and not seeing much of a future for yourself beyond alcohol, drugs and the job centre. There’s no one in the world who will stand up for you or to be on your side. Now, are you ready to get yourself up in the morning, go to class, sit still, listen and learn? And what happens to thes youngsters once the programme finishes and all the fuss has died down? I can only hope that the producers will continue to support the students and that the celebrities might find it in their hearts and busy schedules to be there for them. I read an interesting article in The Guardian by Carrie Quinlan today. In it she writes about our beloved education secretary Michael Gove. There’s not much money hanging around at the moment as we know and Mr Gove has decided in his wisdom that money potentially ear-marked for an expansion of the free school meal scheme for children living below the poverty line is better spent on a fund to encourage councils, head teachers and private businesses to turn around failing schools. It’s a tough decision- feeding children or better schools? Quinlan’s stand is that school meals are more important at the moment but judging by the comments on the article there’s a lot of interest in the subject. School meals are something I know about: I remember how dreadful they were a few years ago and how hard some of us tried to improve them at local level, being dismissed at every turn- after all, schools are about education and teaching and not about providing cordon bleu meals and restaurant standard dining rooms. Or are they? 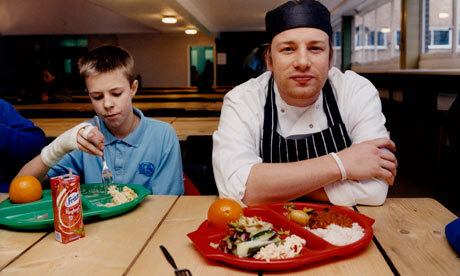 Then along came tousle-haired pukka pixie Jamie Oliver to remind us that food and water are the basics of life and local councils were suddenly shamed into providing better funding and better catering contracts for schools. Catering companies had to review how they operated- chucking out the fizzy pop and chocolate that makes money and adhering to tricky nutrient-based standards. Parent power has been instrumental in this and parent campaign groups sprang up all over the place like the now famous Merton Parents for Better Food in Schools group. Before we knew it, kitchens were being built and improved, hot meals cooked from scratch and numbers of children taking a school meal shooting up. There’s still a long way to go. Standards are not always as good as they could be in secondary schools in particular. I was in a school just this morning where there were all sorts of nutrition crimes being committed in break service. For many poorer children this may be the only good quality meal they have during the day and parents should be secure in the knowledge that their children are getting feed properly at school. You have to be pretty poor to actually qualify for free school meal and I suspect that more children will become eligible as more and more people find themselves without work. Food is a basic of life. The link between a healthier diet and attainment at school has been well documented. Children have smaller systems and need carbohydrate-heavy meals to keep the going and sugar, e-numbers and caffeine have a greater effect on their growing frames than on an adult’s. Schools already have to cope with children who have been fed huge amounts of sugar at breakfast (if they have breakfast at all), children who have tucked into crisps, chocolate and so called energy drinks on the way to school and pack some extras in their bags for break and lunch. It’s already a battle to get children and young people to eat healthier foods as well as junk and the poorest are the most vulnerable. So better schools or better food? Yes, we need superb schools with excellent head teachers but unless the basic physical and emotional needs of children are met they won’t make the maximum of difference. Is it too much to ask for both for our children?